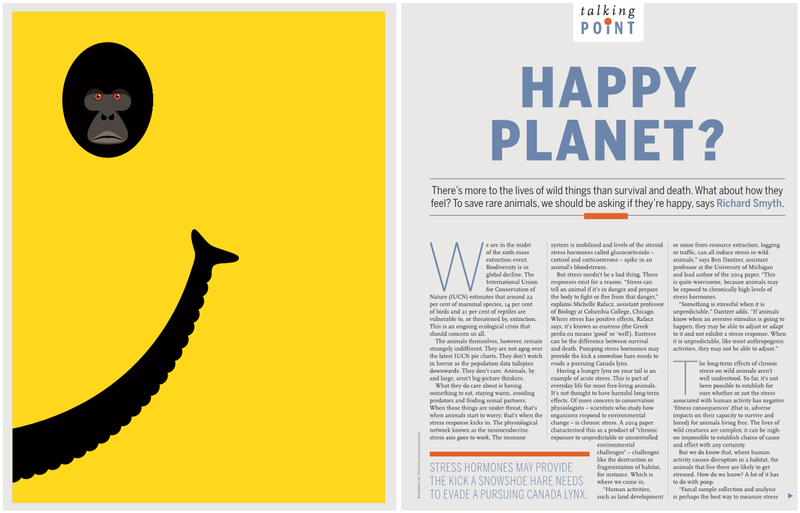 BBC Wildlife feature: Happy Planet? We are in the midst of the sixth mass extinction event. Biodiversity is in global decline. The International Union for Conservation of Nature (IUCN) estimates that around 22 per cent of mammal species, 14 per cent of birds and 21 per cent of reptiles are vulnerable to, or threatened by, extinction. This is an ongoing ecological crisis that should concern us all. The animals themselves, however, remain strangely indifferent. They are not agog over the latest IUCN pie charts. They don’t watch in horror as the population data tailspins downwards. They don’t care. Animals, by and large, aren’t big-picture thinkers. What they do care about is having something to eat, staying warm, avoiding predators and finding sexual partners. When these things are under threat, that’s when animals start to worry; that’s when the stress response kicks in. The physiological network known as the neuroendocrine stress axis goes to work. The immune system is mobilised and levels of the steroid stress hormones called glucocorticoids – cortisol and corticosterone – spike in an animal’s bloodstream. But stress needn’t be a bad thing. These responses exist for a reason. “Stress can tell an animal if it’s in danger and prepare the body to fight or flee from that danger,” explains Michelle Rafacz, assistant professor of Biology at Columbia College, Chicago. Where stress has positive effects, Rafacz says, it’s known as eustress (the Greek prefix eu means ‘good’ or ‘well’). Eustress can be the difference between survival and death. Pumping stress hormones may provide the kick a snowshoe hare needs to evade a pursuing Canada lynx. Having a hungry lynx on your tail is an example of acute stress. This is part of everyday life for most free-living animals. It’s not thought to have harmful long-term effects. Of more concern to conservation physiologists – scientists who study how organisms respond to environmental change – is chronic stress. A 2014 paper characterised this as a product of “chronic exposure to unpredictable or uncontrolled environmental challenges” – challenges like the destruction or fragmentation of habitat, for instance. Which is where we come in. “Human activities, such as land development or noise from resource extraction, logging or traffic, can all induce stress in wild animals,” says Ben Dantzer, assistant professor at the University of Michigan and lead author of the 2014 paper. “This is quite worrisome, because animals may be exposed to chronically high levels of stress hormones. The long-term effects of chronic stress on wild animals aren’t well understood. So far, it’s not been possible to establish for sure whether or not the stress associated with human activity has negative ‘fitness consequences’ (that is, adverse impacts on their capacity to survive and breed) for animals living free. The lives of wild creatures are complex; it can be nighon impossible to establish chains of cause and effect with any certainty. But we do know that, where human activity causes disruption in a habitat, the animals that live there are likely to get stressed. How do we know? A lot of it has to do with poop. “Faecal sample collection and analysis is perhaps the best way to measure stress hormones, since it’s non-invasive,” says Rafacz. “And unlike some other methods, hormones measured in faeces actually give a consolidated picture of hormone concentrations over a 24-hour period, as opposed to a snapshot of what’s circulating in the body in that moment, like what would be found in a blood sample.” Other researchers analyse hair, saliva, urine or even (in whales) earwax. Dantzer points out that blood sampling is often considered the “gold standard” for the measurement of stress hormones, but that it too has its limitations. The process of trapping and sampling blood is liable to send an animal’s stress levels skyrocketing. Scientists generally have a three-minute window of opportunity to take a sample before new stress hormones flood the animal’s bloodstream. Of course, ‘happiness’ is a fuzzy concept. It’s difficult enough to get a handle on in humans; in animals, it’s even more elusive. Michelle Rafacz agrees. “What does it mean, for example, for an ant to be ‘happy’?” she asks. “We can’t ask it if it’s happy or look into its brain, but we can measure behaviour and stress hormones, so that’s what we do. Even then, do we really know if the ant is ‘happy’? “I think it’s far more important to first understand what it means to be a certain species. How does it behave in its natural habitat? What aspects of its environment affect stress? Does the animal have all of its basic needs satisfied? Once we understand these things, we can use them as a baseline of sorts for knowing when something is wrong.” It’s hard to see how we can get closer to a definition of animal happiness than this: that a happy animal is an animal simply doing what it does. Chronic stress compromises this. So when our actions cause chronic stress, we’re making animals – for want of a better word – unhappy. Should we care about this more than we do? The odd thing is, in some circumstances, we care about it a great deal. In discussions of livestock welfare, for example, the terms ‘stress’ and ‘distress’ are often used interchangeably. In the UK, guidance on keeping pigs lists a range of factors – including overcrowding, feed deficiencies and inadequate ventilation – that can cause the animals stress; the guidance on cows and sheep places a similar emphasis on keeping stress levels to a minimum. In many contexts it’s second nature to us to avoid causing stress and unhappiness in the animals around us. Most of us take good care of our pet cats, dogs, goldfish and budgerigars. I feed my cat, give her things to play with, refrain from kicking her down the stairs when I’m in a bad mood – and I don’t do this because she’s a rarity, a threatened species, a cat on the brink of extinction (in fact, she’s a ten-a-penny rescue tabbytortoiseshell). I do it because I don’t want her to feel stressed. I want her to be happy. Really, thinking about conservation in terms of species is a very human-centric approach. Animals don’t care whether their species is thriving or not. Orcas are (next to humans) the world’s most widespread mammals, but a Puget Sound orca going hungry in polluted waters is concerned with its own pod, not its far-off cousins in the Ross Sea or the Norwegian Basin. A lapwing deprived of its nesting habitat by a developer’s bulldozers doesn’t find much comfort in the fact that there are other lapwings, over in the next valley, that are doing very well. Instead, it feels stressed – unhappy and afraid. And that’s our fault. How is this different from kicking the cat? The question becomes even more pressing when you consider the devastating force of fear in an animal’s mind. In her 2005 book Animals In Translation, Temple Grandin, professor of animal science at Colorado State University, maintains that “the single worst thing you can do to an animal is to make it feel afraid. Fear is so bad for animals – I think it’s worse than pain.” Most of the scientific literature on stress and fear in wild animals focuses on the impacts these things can have on their ability to survive and breed. Very rarely is stress considered a detrimental impact in itself; very rarely do we see human activity – building, logging, polluting, mining, bulldozing – framed in terms not of the species it might endanger, but of the stress it might cause wild animals. This isn’t to say that a species-focused approach doesn’t have a huge part to play in conservation. Apart from anything else, it allows us to quantify things, to break down what’s left of the natural world into data we can measure. We’ll never really be able to do that with stress and fear, however much poop, hair and blood we collect. The problem is, crisp, clean data can make things seem simpler than they are. Solutions become less about comprehending complex problems than about manipulating the numbers. The modish concept of ‘deextinction’ is a good example. So, we don’t have enough northern white rhinos or California condors (or whatever it might be)? We’ll simply make more! Never mind the wider problems that drive these species and so many others to near-extinction in the first place. We’ll always have a tendency to put ourselves first; we’re only human, after all. But that isn’t the same thing as being wilfully blind to the consequences of our actions. When we destroy habitats, we don’t just denude the biodiversity of our planet, we cause chronic stress. We create a climate of fear and anxiety in wild creatures. ‘Cruelty’ seems a strange word to use in a conservation context; cruelty, surely, means hacking the tusks from an elephant, or sending hounds after foxes and hares. But it’s the word we’d surely reach for if we treated cats or dogs or pigs the way we treat free-living animals. You might argue that stress is natural for animals. You’d be right. It’s natural for us, too, but that doesn’t mean we like it. I’d take a dim view of someone who stole my car or wiped my hard drive and then tried to shrug it off by saying: Hey, stress is just a part of life! Species extinctions are disasters. But death is only one element, only one datapoint, in the wild world around us. The lived experience of wild things matters too. It’s another reason to tread carefully, even among the commonplace. * This article was originally published in the May 2017 edition of BBC Wildlife magazine (vol. 35, issue 6).